Some insurance claims may be unusual but an industry body says that policies should be checked at Christmas. Gadget insurance company, Protect Your Bubble, said excuses for iPhone claims included the phone falling into a kettle, being lost when the owner was skydiving or being chewed by a dog. 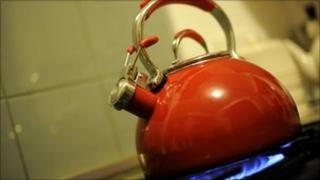 With expensive gadgets being bought at Christmas, the Association of British Insurers said limits should be checked. Home insurance policies might need to be amended to cover these items. A spokeswoman for the association said it was worth calling the insurance company to check items were not worth more than the limit on the value of single items in the home. "The chances are that they are already covered, but when you are spending a lot of money it is worth considering," she said. Major home improvements could affect home insurance, and policies might not cover items such as laptops or tablet computers that were taken outside the home, she added. Shoppers can make a judgement as to whether insurance is value for money or not when buying a new gadget. Experts suggest that shopping around will reveal a range of differently priced deals. The most common insurance claims for iPhones, according to Protect Your Bubble, were for cracked screens, phones stolen while the owner was sending a text message, and various technical problems. Other regular claims were for phones left on a car roof and then smashed when the owner drove off, or phones dropped in the bath or toilet. The list of more bizarre claims included phones dropped from a hot air balloon, accidentally buried in the garden and one damaged when juice from a defrosting piece of meat leaked into it.